Last month, Marvel kicked off a new viral marketing campaign for Captain America: Civil War. They brought back MCU character Christine Everhart, played by Leslie Bibb, in a series of new videos designed as news reports for WHIH World News. The videos feature Everhart, along with political correspondent Will Adams (Al Madrigal) as they debate a number of issues regarding The Avengers, that will be addressed in Captain America: Civil War when it hits theaters on May 6. The fictional news organization has also been posting numerous news tidbits on their Twitter page, one of which reveals some interesting details about The Hulk (Mark Ruffalo). As you likely know by now, Captain America: Civil War will feature almost every established hero in the MCU, with the notable exceptions of Thor (Chris Hemsworth) and Hulk. The Green Goliath was last seen in Avengers: Age of Ultron, taking off for parts unknown after commandeering a Quinjet. 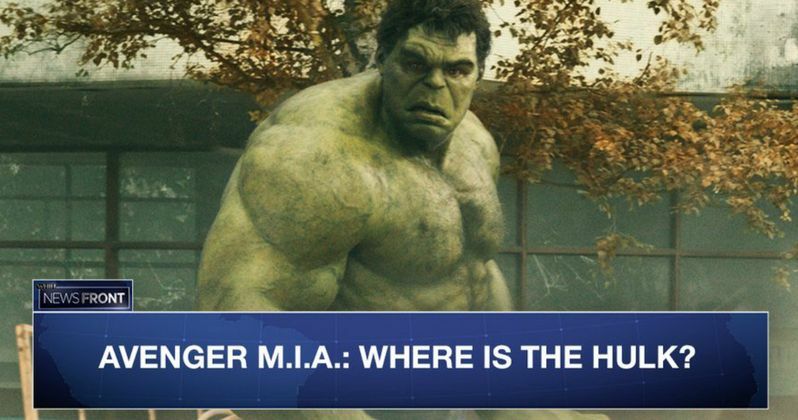 We have no idea where he took off to, but one of the tweets from the WHIH Twitter account teases that government officials around the world have been asking where the Hulk has disappeared to. We know that Thor and Hulk will be teaming up in Thor: Ragnarok, where the two Avengers are said to be going on a "cosmic road trip." There have been rumors that Thor is banished from Asgard by the new villain Hela, reportedly played by Cate Blanchett, who has teamed up with Thor's evil brother Loki. It has been said, but never confirmed, that Thor will end up on a planet full of gladiators, where he has to face the current champion in battle, Hulk. Recent tweets from the WHIH account also tease an upcoming investigation into Vision, Stark Industries developing consumer applications for Tony Stark's (Robert Downey Jr.) arc reactor, and another investigation about Brock Rumlow, a.k.a. Crossbones (Frank Grillo), who has been missing since the events of 2014's Captain America: The Winter Soldier. We know from set photos and other details that he will surface in Captain America: Civil War in his full Crossbones costume. With just a few days left until Captain America: Civil War hits theaters, we'll have to wait and see if there will be new viral videos that surface between now and May 6. We don't know for sure if Christine Everhart or Will Adams will be featured in Captain America: Civil War, but Everhart surfaced last year in the months leading up to Ant-Man's release, with a series of news reports centering on Scott Lang (Paul Rudd). Since Christine Everhart didn't show up in that movie, it's certainly possible that she won't have a presence in Marvel's Civil War, but we'll find out for sure in just a few short days. Take a look at the latest tweets from the WHIH Twitter account to get ready for Captain America: Civil War's release on May 6.